On this date in 1938, 17-year-old Herschel Grynszpan, an unem­ployed German-born Polish Jew living il­legally in Paris, France, fatally wounded Ernst vom Rath, Third Secre­tary at the Ger­man em­bassy. He shot Rath, he told authori­ties, out “of love for my parents and for my peo­ple.” His was an act of pro­test against the Nazi govern­ment’s depor­ta­tion of some 12,000 Polish Jews living in Ger­many, including mem­bers of his family, who were stripped of their pro­perty and herded aboard trains to Poland. Two days after the shooting, which was the fif­teenth anni­ver­sary of Hitler’s unsuc­cess­ful Beer Hall Putsch—the ho­liest day in the Nazi calen­dar—Rath died. That night care­fully or­ches­trated anti-Jewish vio­lence “erupted” through­out the Third Reich, which now included post-Anschluss Aus­tria, renamed “Ost­mark” after union with Nazi Germany. 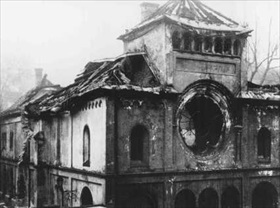 During Kristall­nacht (“Night of Broken Glass”) and for the next 48 hours, Nazi thugs burned or damaged as many as 1,500 syna­gogues and ran­sacked and smashed the windows of more than 7,500 busi­nesses, com­mu­ni­ty centers, and homes. Almost one hun­dred Jews were killed by govern­ment esti­mate (almost cer­tainly low-balled). Also killed were a few gen­tiles (“Aryans”) mis­taken for Jews. Approx­i­mately 20,000–30,000 Jews be­tween the ages of 16 and 60 were hauled off to Ger­man con­cen­tra­tion camps in the Novem­ber pogrom. Heaping in­sult on in­jury, the Nazi govern­ment forced the Jewish com­mu­ni­ty to pay Juden­ver­mögens­ab­gabe, a col­lec­tive fine of one bil­lion Reichs­marks for the murder of Rath (equal to roughly 5.5 billion U.S. dollars in today’s cur­rency), which was levied by the com­pul­sory acqui­si­tion of 20 per­cent of all Jewish pro­perty. Addi­tionally, the state demanded that Jews sweep up the rioters’ mess and pay the state six mil­lion Reichs­marks to cover the cost of in­sur­ance claims for pro­perty damage. The mur­derous ram­page of Kristall­nacht, followed by the force­ful Ger­man annex­ation of Czecho­slo­va­kia in March 1939 and the atro­ci­ty that swept over Poland later in Sep­tem­ber, built up a wave of resent­ment against Nazi Ger­many through­out the world—a wave that crashed over the U.S. two years later in Decem­ber 1941. Former Kaiser Wil­helm II, from his exile in Holland, char­ac­ter­ized the actions of his country­men as “gang­sterisms,” adding that for the first time ever he was ashamed to be a German. 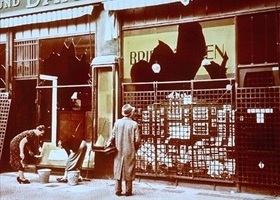 Left: Example of damage directed at Jewish busi­nesses during Kristall­nacht (literally “crystal night”), a witti­cism alluding to the enor­mous num­ber of glass win­dows broken through­out the night and next day, mostly in syna­gogues and Jewish-owned shops. With Kristall­nacht the Nazis achieved three of their goals: confis­ca­tion of Jewish pro­perty by local branches of the Nazi Party to help finance the mili­tary build­up to war; increased sepa­ra­tion, margin­ali­za­tion, and iso­la­tion of Ger­man Jews (in cer­tain neigh­bor­hoods Jews were required to sell their homes at huge losses and move to other neigh­bor­hoods); and most impor­tantly, the move from the anti-Semitic policy of discrim­i­na­tion to one of ethnic cleansing, which con­tinued in the Third Reich and con­quered territories until the end of World War II. 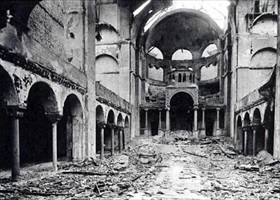 Right: Interior of Berlin’s Fasenenstrasse Syna­gogue, con­structed between 1910 and 1912 in the affluent neigh­bor­hood of Charlotten­burg off Kurfuersten­damm, after it was set on fire during Kristall­nacht on the morning of Novem­ber 10, 1938 (per­haps not ironi­cally, on Martin Luther’s birth­day). In Berlin 9 out of 17 syna­gogues were torched; in Vienna, the Aus­trian capi­tal, 95. In all, over 1,000 syna­gogues were vandalized or destroyed. Left: Not even the smallest towns in Germany escaped the Nazis’ may­hem and wrath against Jews. 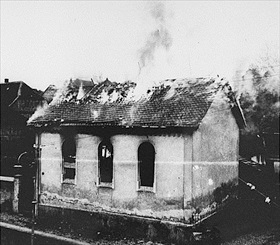 In this photograph a small syna­gogue in Ober Ram­stadt (Hessen, Germany), roughly 18 miles south of Frank­furt am Main, burns on Kristallnacht. 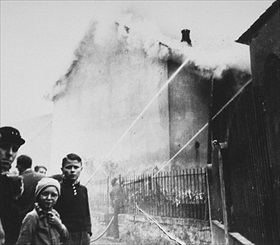 Right: As the Ober Ramstadt synagogue burned, local resi­dents watched fire­fighters instead save a near­by house. In some Ger­man cities such as Cologne police handed out axes and other tools of destruc­tion to trouble­makers in the mob, supplying them with lists of names and addresses of Jewish pro­per­ties for them to destroy. The mobs cut fire hoses when con­scientious fire­fighters directed water onto Jewish properties. Left: Munich’s Herzog Rudolfstrasse syna­gogue off Maximil­lian­strasse. By mid­night, Novem­ber 9, 1938, attacks on Jewish busi­nesses, homes, and syn­a­gogues were occurring all over Ger­many and Aus­tria. Mobs roamed streets, shouting, “Beat the Jews to death!” In Munich, the first syna­gogues started burning at mid­night. In Berlin, Kristall­nacht was delayed till 2 a.m. on Novem­ber 10 so that the police would have time to pre­pare. They identi­fied Jewish pro­per­ties that would be destroyed and set up road­blocks to keep traffic away from those areas. Police were instructed not to interfere with the rioters. Right: As the looting and destruction wound down on Novem­ber 10, 1938, the arrests began. Jewish men of all ages were rounded up and marched through the streets as some of their Ger­man neigh­bors hurled insults at them. 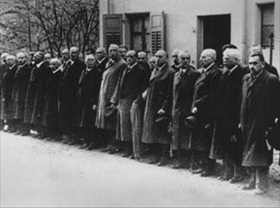 In this photo­graph Jews arrested after Kristall­nacht await depor­ta­tion to Dachau con­cen­tra­tion camp north of Munich. Others were sent to Buchen­wald and Sachsen­hausen. The treat­ment of camp inmates was brutal, but most inmates were released within three months on the con­di­tion they leave Ger­many. In the ten months following Kristall­nacht, more than 115,000 Jews emi­grated from the Reich. As part of govern­ment policy, the Nazis seized houses, shops, and other property the émigrés left behind.